Simo Maninginingi Kwepe was hit by a train on Friday morning. By Kristine Liao for GROUNDUP. A learner, who was about to turn 17, was killed on the Cape Town Southern Metrorail line on Friday, 12 April. “Preliminary reports indicate that a young male, +/- 16 years old, fell from a moving train between Salt River and Woodstock while attempting to jump from one train to another,” said Riana Scott, spokesperson for Metrorail. Simo Maninginingi Kwepe, from Zonnebloem NEST Senior School, was certified dead on the scene. The incident was reported at 7.33am. Emergency services and the police closed the line during their on-site investigation. Train traffic was diverted until 12.30pm. According to Vuka, a number of people have been killed on Cape Town Metrorail lines since January. Metrorail could not confirm the number killed at the time of publication. 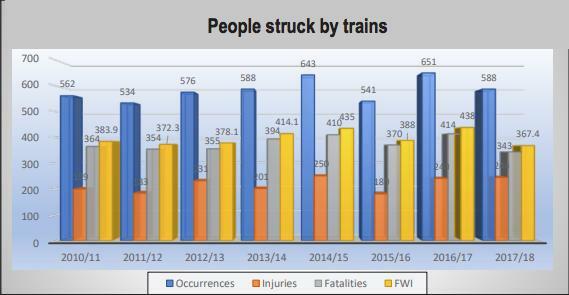 The Railway Safety Regulator reports that 343 people were struck dead by trains in 2017/18. Kwepe died less than 24 hours after Minister of Transport Blade Nzimande announced his plans to address the problems within the Passenger Rail Agency of South Africa’s (PRASA), state-owned enterprise that runs Metrorail. PRASA has been embroiled in corruption scandals known as PRASALeaks.